Been reading a great book, London's Pirate Pioneers by Stephen Hebditch, published earlier this year. Growing up, pirate radio rather passed me by. I was too young to experience the likes of Radio Caroline & co, transmitting from rusty tubs in the North Sea in the mid-60s ('celebrated' in the dreadful film, The Ship That Rocked a few years ago), and was completely unaware of onshore stations like Radio Jackie and Invicta who broadcast mainly on sundays and public holidays in the 70s. It was only in the 80s that I became aware of a few stations like Alice's Restaurant, JFM, Horizon and Kiss FM, though to be honest they didn't really play the music I was into at the time. But reading about it all now brought back a kind of retrospective excitement: the guys (and it was mainly guys) rigging up aerials on the rooftops of council blocks or sometimes in woodlands (good tree-climbers were prized); the dodgy transmitters and basic bedroom studios; the Home Office raids… Funny to learn that Gilles Peterson started off on Civic Radio aged just 14, and even comedian Keith Allen had a go. Come the new decade, many stations like Kiss FM went legit, although the rave scene attracted its fare share of illegal air time. In any case, the author (who was heavily involved in the scene at the time and edited a magazine about it) lost interest and the book staggers to a halt in 1990. 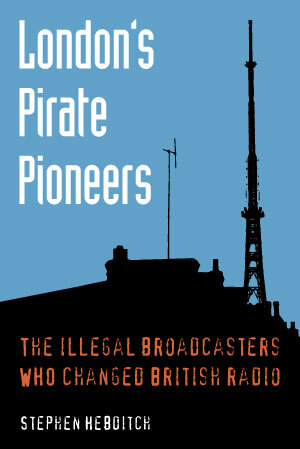 Of course, pirate radio is still alive with around 150 stations currently operating in Britain, the line's share still in London, but with internet stations it is a different animal now. I'd like to have learned more about the scene elsewhere in Britain, but that's another book. Anyway, a thorough account of the early days; and I believe there was an accompanying exhibition at London's ICA too.